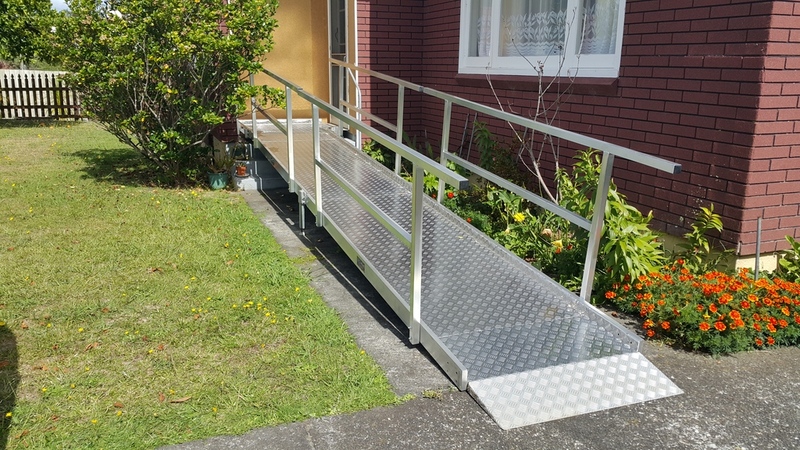 We can custom make our aluminium modular ramps to suit any user’s needs on request. View our convenient range of standard Rubber Ramps. Buy from our web shop and have the ramps delivered to your door. Free shipping NZ wide for online orders. 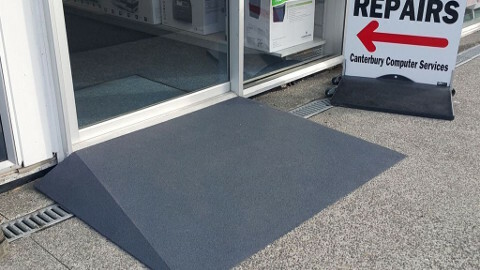 We can make your home or shop compliant and safe for disability access. Request a quote or submit an order below. Introducing the new Able Axcess Shower Insert. No extensive bathroom modifications required! We freight, install and remove when no longer required - all for a fixed weekly price. Able Axcess have relocated the workshop and offices to a great new facility. 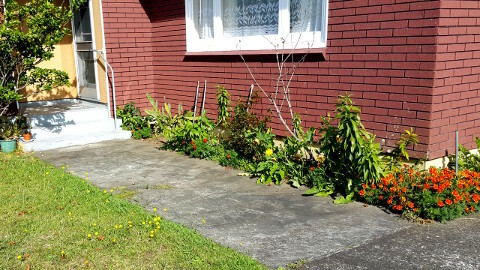 Come and see our products or talk to the friendly team at 2 Stafford Street, Feilding. We have been working on a much safer design for our handrail system. The new handrails are fully continuous, with curved ends and round grab rails. 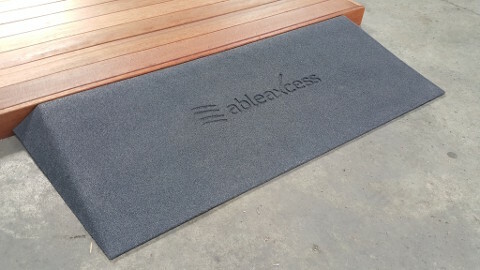 Able Axcess are the leading suppliers of aluminium mobility ramps for residential and commercial disability access. We manufacture rubber threshold ramps, wheelchair ramps, and now level shower inserts. View our Online Catalog to instantly buy rubber access ramps or request a quote for our modular aluminium ramps. Totally weatherproof and perfectly suited to permanent outdoor use. No footings or foundations required. All modules interlock and free-stand. Adjustable legs to fit over undulating ground or steps so no need to alter your property for it to fit in place. Cost Effective modules can be reused in multiple configurations which saves funding for other housing modifications. No permits or builders required. Made from Recycled car tires sourced in New Zealand. The ramps are heavy enough to stay in position without being fixed. Custom made to suit any doorway, ranch slider or step. Portable options that can be taken with you to friends houses/ cafes/ parks. Guaranteed for 5 years from wear and tear with standard usage. Can you provide me with a quote for a short term ramp for my client? Can I show my client some photos when I visit them? Yes. Click here to view our catalog. How are the ramps fixed to the ground/house? 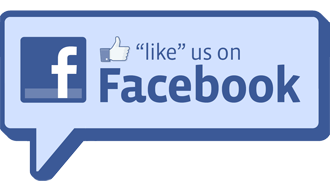 Click here to see our installation methods. Will the steps need to be removed for the ramp to fit over them? No. Steps remain in place and the ramp can fit over the existing environment. What options do you have for extreme weather prone environments? A frost-proof rubber matting is available for frosty or icy environments, or high quality Autex outdoor carpet for high temperature environments. What happens when the ramp is no longer required? The ramps can be completely removed after use and made good for re-use. Our installers dismantle the ramp and return it to our workshop where the ramps are chemically cleaned and checked for quality issues. How long does it take to have a ramp installed? Once our installer arrives on site, the ramp will usually take between 1 and 4 hours to be installed. Please contact us as soon as possible if you have an urgent request. Can you make rubber ramps with cut outs, tapers, uneven heights, kerbing, handrails? Yes. We can custom make any size or shape. Click here to request a quote or order. Our rubber is locally sourced from recycled car tires. What standard ramps do you have ready to ship? How long will it take to have a custom ramp made? 5-10 working days to manufacture and cure, plus shipping. Are the ramps very heavy? Smaller ones aren’t so heavy but because they’re made of solid rubber for durability larger ones can be heavy. Do they need to be fixed down? Not usually, however we can supply an adhesive to fix down permanently if required. Can you measure my door for a rubber ramp? If you are unable to measure the door yourself, have you tried asking a family member or neighbor to help? We may be able to stop by and take a few measurements, however this may cost extra depending on the urgency and your location. Contact us to find out if we are scheduled to be in your area.